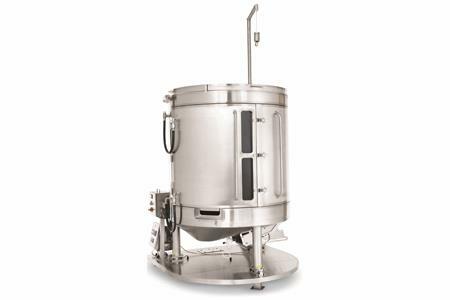 MilliporeSigma’s Mobius® Power MIX 2000 single-use mixing system is engineered with advanced technology to effectively handle difficult-to-mix buffers, culture media powders and other pharmaceutical ingredients. The Mobius® Power MIX achieves a strong vortex using an impeller design and motor based on magnetically-coupled NovAseptic® technology, a proven mixing technology in stainless steel tanks. The Power MIX 2000 provides accessible, sterile zero deadleg sampling directly from the mixing container. A Probe Port allows for insertion of either a reusable probe for non-aseptic processes or a pre-sterilized, single-use sensor for in-process pH measurement of aseptic processes. Other design features make the mixing system easy to use, enabling loading of bags by one person and offering an optional integrated hoist for powder delivery. The Mobius® Power MIX 2000 system provides the industry’s broadest working volume from 300 to 2,000 liters for processing flexibility. The new mixing system builds on MilliporeSigma’s industry-leading portfolio of Mobius® single-use solutions for upstream and downstream processing.